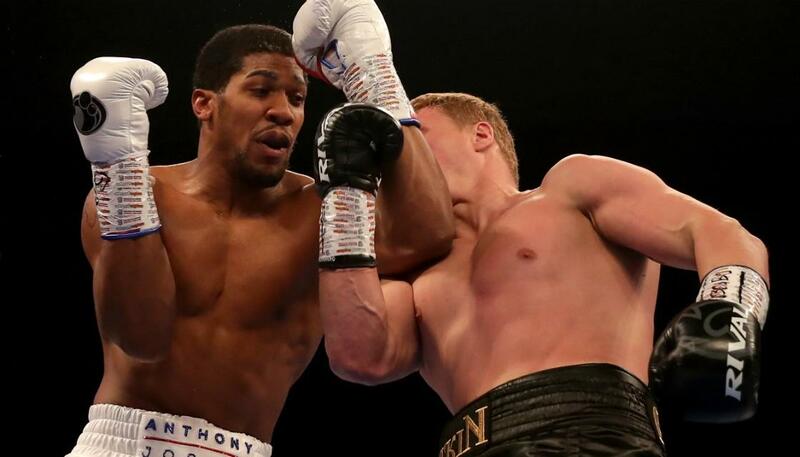 Unified heavyweight champion Anthony Joshua 22-0 (21) overcame a slow start to score a seventh round stoppage of crafty veteran Alexander Povetkin 34-2 (24) at London’ Wembley Stadium on Saturday night. Fighting in front of an estimated 80,000 fans, the British hero was caught early by the 39-year-old Russian, who broke Joshua’s nose in the early rounds. Povetkin boxed a smart fight for the first five rounds and was clearly getting the better of the action against a surprisingly timid Joshua, who didn’t open up until the sixth frame. In the seventh round a left hook sent Povektin back on his heels and a follow-up right cross sent him crashing heavily to the canvas. After the mandatory eight count Joshua jumped on his wounded challenger, pummelling him into the ropes to score the stoppage victory at 1:59 of the seventh round. “Povetkin is a very tough challenger,” said Joshua after the fight. “He proved that tonight with good left hooks and counterpunches. “I knew he was strong to the head but weak to the body. I was just mixing it up. The 28-year-old champion was taken the full 12-round distance in his previous bout against New Zealand’s Joseph Parker in March. “I got my knockout streak back,” said Joshua. Despite appearing to lose most of the early rounds, the three official judges at ringside had Joshua comfortable ahead at the time of the stoppage by scores of 58-56, 58-56 and 59-55. The fight was a rarity in boxing, pitting the super heavyweight champion from the London Olympics in 2012 against the super heavyweight champion of the Athens Olympics in 2004. With the knockout victory Joshua improves on Wladimir Klitschko’s 12-round points win over Povektin for the same world titles in 2013.